Wayne and I've been talking about replacing our truck. It runs fine, but it's a 1997. Last week I went to the two dealers in Powell River. I started with Ford because I consider myself a Ford person. My first car was a Mustang, and I've had mostly Fords throughout my life. Then I went to the GM dealer. I told Scott what I was looking for. His suggestied a white truck. I said, "Anything but white!" "Well, how about this one?" There was a maroon (Sonoma Red Metallic) GMC Sierra 1500 4X4 next to it. I said, "That's perfect." Scott let me take it for a test drive, so I went down to the condo to surprise Wayne. As you can see, it's a new version of our old truck. We went back the next day and sealed the deal. We have to wait for a matching canopy and bed liner, so our trusty old truck will stay in service a little bit longer. If you're in the market for a new (or used vehicle), go down to Massullo Motors in Powell River and ask for Scott Franklin. Last week, I went to town to hear readings from Slices: A Memoir Anthology published by the Powell River Public Library. The Library, with funding from Canada's New Horizons for Seniors Program, has been conducting memoir writing workshops. This great book is the result. In it, you will find short stories from near and far -- even a "road trip" by Rudy, Squirrely Shirley, and Whitey to "shake and bake" California. Joan read "Teen Town Rock and Roll" when famous Vancouver DJ Red Robinson came to the Saturday night dance at the Powell River Elk's Lodge. Her words take you back to 1958, and out on the floor, twisting and bopping along with Joan in her neon blue felt poodle skirt. November has brought early snow up the lake. It isn't heavy yet, but the dusting in the high country makes for beautiful reflections on Powell Lake. It's no fun to get home and find you've been invaded by mice. We figured we'd been inundated by hoards because there was evidence -- in the kitchen, bathroom, even upstairs in the bedroom. You know what I mean - poop everywhere! I attacked the kitchen with hot water and soap. Wayne checked possible entry points. I had to throw out bags of trail mix, dried cranberries, even Stick Tail's dry cat food. Wayne got our Havahart live trap and set it up under the pantry. Before bed we caught our first mouse and Wayne put him outdoors. In the morning, he set up the "Mouse Motel" with a large plastic tub complete with water, food, and a plywood roof. The second night we caught mouse number two. When Wayne went to add him to the "Mouse Motel," he got a surprise. He found three mice huddled together. During the night, two more jumped inside to get the food. We didn't catch any more, so Wayne put the "Mouse Motel" in our tin boat and headed to Goat Island. On the way, he saw a mouse running along the gunnels. He donned his gloves and returned the escapee to his "room." At the island, all four mice scurried off to find new homes. But as Wayne was on his way back, he saw a fifth mouse running along the gunnels. Maybe he was a stowaway from under the boat's floorboards. Wayne reunited him with his buddies. This week the temperatures have dipped below freezing at night. Last year, I was successful in keeping some of my geraniums alive outdoors over winter. You can see what I did here. Two of the four roots survived and regrew into beautiful big plants with large blossoms. This year I had even more geraniums, so I decided to try again. I trimmed back and dug up all nine of my plants (including the two survivors). The soil was dry and the roots came out in balls that I tried to leave undisturbed. I replanted all of them close together in one large blue barrel on the transition float. To make a mini-greenhouse, I bought a clear plastic paint drop sheet at Canadian Tire. There was plenty left to use in case a replacement is needed later during the winter. I also bought a long heavy weight bungee cord to hold it in place. I poked small slits around the edge about 5 cm (2 in) apart to allow the plants to "breathe." The blue barrel is in direct sunlight (if we get any) for most of the day. My plan to periodically open the top on warmer days so the plants can get more air circulation. After the leaves die back, and before long freezing nights arrive, I will mulch the surface of the soil with crumpled newspaper like I did last year. Last year's survivors ready for a new winter. Last week I posted about technology, explaining that our float cabin is off the "technology grid" for Internet. But we do use satellite technology for radio. We've had XM radio (now SiriusXM Satellite Radio) for over ten years. Ours is set up on our kitchen shelf along with our phones (tech central). From here, wires lead to their antennas. We love listening to audio for television channels such as CNBC (for Wayne's stocks) and CNN (for world news). Wayne follows U.S. professional and college sports on channels like ESPN Sports Radio and College Sports Nation. We also enjoy today's hits and classics on The Pulse. Having a wide range of music, news, investment, sports, and talk radio keeps us up to date with current affairs. This time of year, our skies are usually cloudy or foggy. Occasionally, they are brilliantly clear. Recently, we headed down the lake on calm water with bright blue above, and beautiful reflections below. Cassiar Island in the foreground with a small cabin on the shore. On our way, we passed .75 acre Cassiar Island. Before the dam at the mill, installed in the early 1900s, Cassiar was larger and the site of a produce farm for the new town of Powell River. Now it's privately owned with two cabins and several outbuildings. A warning light on the west shore guides logging crew boats (and cabin owners). Goat Island on the right with fog still hanging in First Narrows. Next is huge Goat Island that makes Powell Lake circumnavigate its steep shores. And yes, you can see mountain goats climbing its towering cliffs on the north shore. Goat was instrumental in the creation of Powell Lake, forcing ice age glaciers around its resilient granite outcroppings. Grinding ice and embedded rock carved a deep fjord all the way around on it's way to the sea. Fog cleared from Powell Lake in what seemed like just moments. But, the narrow channel of Powell River let the remaining fog over the Strait of Georgia make its way to the Shinglemill marina. Last week I told you about how important our chainsaw is for gathering wood. Without our wood-burning stove, we couldn't live in our cabin year-round. Another important task is maintaining our woodstove to prevent creosote buildup. Several times during the burning season, Wayne goes up on the porch roof to clean out the external stovepipe. At least once a year, we remove and clean the indoor pipe and scoop ash off the smoke shelf. There are two beneficial reasons. The first, is safety. Creosote can cause chimney fires. Secondly, the fire burns more efficiently, which in turn reduces creosote buildup. Here's what came out of the pipe this time. I designed a tool to use to help scrape out the horizontal pipes. I call it a Woodstove Sock Puppet. Since we always clean our pipe when there's no fire, it isn't dangerous to you a cloth device. The extra surface area helps Wayne scoop out as much buildup as possible. ... once you're finished painting, you have to start all over again. That's what Wayne says about our float cabin deck. At least once a year, the cedar boards need to be repainted with wood stain. We've tried a variety of colours. The first was light tan, but it didn't go well with our light yellow walls. Then we tried redwood, and it was a hit. The wood stain helps our cedar deck boards last longer. Another bonus, the slimy moss that used to come after winter rains doesn't form on the painted surface. That used to make it dangerous walking outdoors on a wet deck. My life took a lot of twists and turns last year, and I didn't use my sourdough starter. When I checked in April, I found my cabin batch had gone bad. That was a sad day. I'd been nurturing it in my fridge for over four years! But I'd cloned a batch for town. When I cleaned the fridge last week, I was surprised it still appeared OK after a year of neglect. So I took it back up to the cabin to see if it would revive. And to my surprise, it did! YEA! Here's the original recipe from Sourdough Cookery by Rita Davenport. It's available at Amazon, but maybe you can find one at your favourite used book store like I did. It's a great little paperback with 220 recipes from starter to breads to cakes to main dishes. Don't use metal bowls or utensils. Mix dry ingredients. Add lukewarm water (I used skim milk) and stir to a smooth paste. Cover with a towel and set in a warm place (85°F/30°C) to sour. Stir several times a day. In 2-3 days, the starter will be ready. Store in a heavy plastic container with a hole in the lid (or a small plastic bag) to allow gases to escape. I also use a bowl underneath to catch drips. Wayne says it's "alive" (actually the yeast is) when it bubbles over like the blob. When using your starter, always reserve at least 1/2 cup. Replenish it with 1/2 cup water (again, I use skim milk for a tangier flavour) and 1/2 cup flour. Leave out overnight, stir down and return it to the refrigerator. They recommend "feeding" your starter once a week if you don't use it, but mine lasted a LOT longer. If it doesn't bubble enough, add a little extra dry yeast and lukewarm water for a boost. Sometimes a clear liquid will form on top. That's OK, just stir it back in. If the starter or liquid turns pink, it needs to be discarded. Each sunny day this time of year deserves celebration. Can you see the line of clouds just over the treetops? That's evidence of the jet stream. The jet stream is an area of fast moving air where air masses meet. This shows we are in a fair weather pocket north of the jet - YEA! On a normal day, we get two sunsets. The first is when the sun sinks below the Bunster Range to the west and direct sunlight leaves our cabin deck. The second, is when the sun's shadow reaches the top of Goat Island in front of our cabin. For us, that's second sunset. But this time of year, we experience three sunsets. The trees across the Hole in the Wall start blocking the sun's rays at 3:15 pm. The sun's brilliance fades and the temperature instantly cools. About 15 minutes later, the sun exits from the treetops and the warm direct sun returns. Then it arcs lower in the sky heading for the Bunsters to set for a second time. Finally, the shadow climbs up the side of Goat Island until 5:45 pm, pushing the last sunlight into the darkening sky for a brief twilight. 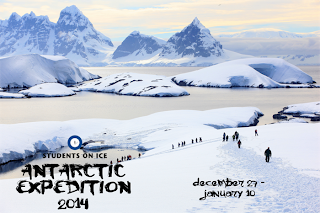 I would like to take this opportunity to introduce a high school student from Powell River, BC, who dreams of going on a personal quest to Antarctica as part of an educational program called Students on Ice to learn about environmental issues and climate change. I wish I had embarked on such an opportunity. I am excited and inspired by the natural environment and think it is important for my generation to learn about sustainability and climate change. I think that the hands-on learning of the expedition will teach me about world issues in a new and different way, and I want to be able to share what I learn with other students at my school and in the community when I get back. 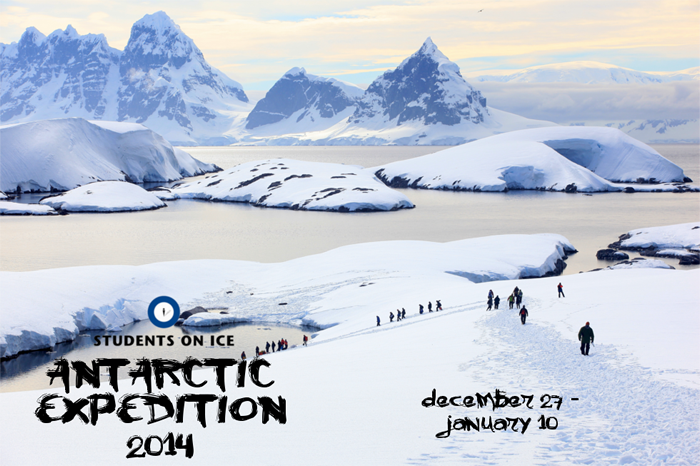 The expedition will be from December 27, 2013 to January 10, 2014. Samantha has a fundraising goal of $15,000 to become one of a select group of 70 students from around the world. This time of year we use our chainsaw a lot. We are gathering wood to store for winter use in our Kozi woodstove. Some wood we gather from the lake is a burnable kindling size, but to get larger chunks we need to cut small logs for splitting. Lately, Wayne's saw has been hard to start and struggles when cutting even smaller logs. So he got out the manual for our Stihl chainsaw and broke it down to give it some good maintenance. Over the years, our good friend John has done this for us. But Wayne has learned a lot from him to become more self sufficient. We enjoyed fresh tomatoes all October. Even though I picked them green in late September to ripen indoors, they turned out perfect. But when it came time for a trip at the end of October, I had a few left we couldn't consume. I decided to stew the last and freeze them. It's so nice to have a regular size propane refrigerator with a large freezer at the cabin. It was one of the improvements we made in 2011 that has made our off-the-grid home perfect. I diced the remaining tomatoes and heated them through on my propane stove (another of our 2011 upgrades). I used my Bernadin plastic freezer jars and got five half pints. They'll be handy to grab for soups, sauces, or casseroles. ... we had a front move through bringing lots of northwest wind. It's football weekend. Wayne and I came down to Oregon State in Corvallis to watch the match-up with our team from the University of Southern California. The USC Trojans met the Oregon Beavers for an excellent football game this evening. The 31 to 14 winning results gave the Trojans a 6-3 record (2nd for the south division of the PAC12) and the Beavers a 6-3 record (3rd for the north division of the PAC12). Things are heating up with just a few conference games to go for the season.